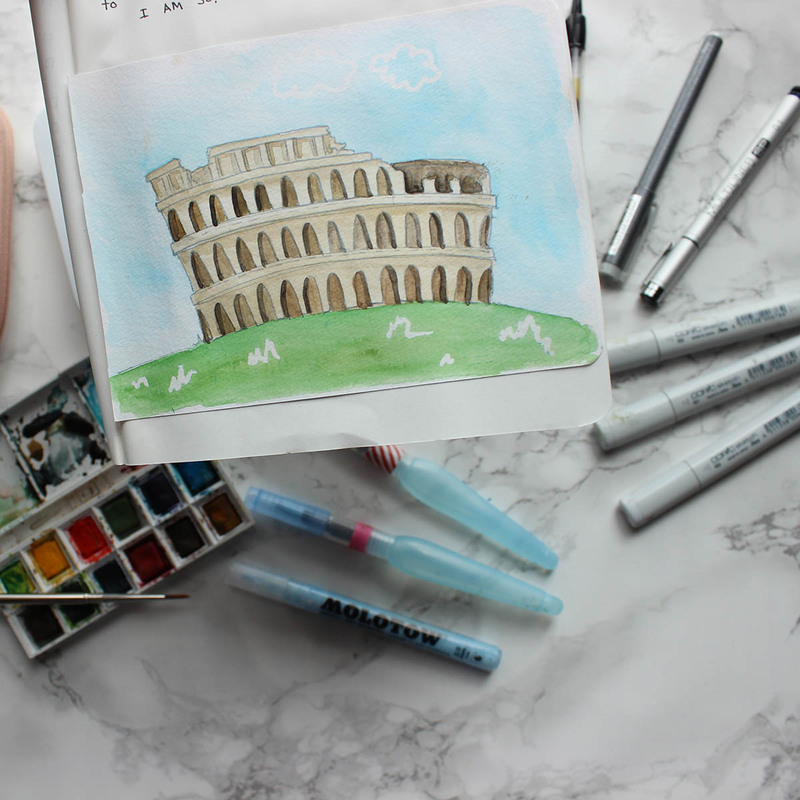 On the second-to-last day of my trip to Rome this summer, I was tired, lost, and wandered upon an art supply store on a narrow street near Piazza Navona. While there I discovered a product I’d not seen in the US before- masking liquid in a pen- and eagerly bought it for about 7€. I immediately began using it in my travel journal for my paintings of things I saw in Rome and found, after a little testing, that I loved the effects it created. When I got home to Seattle, I was shocked to see the same pen selling in local stores for more than double what I paid in Rome, and, while the price was much lower on Amazon, the reviews there were pretty terrible. 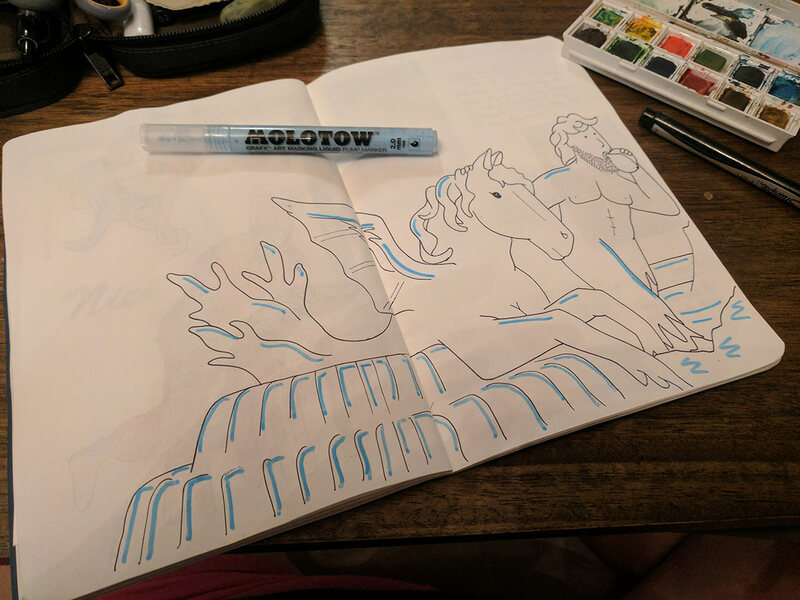 I realized that most of the reviews sounded like they were using it wrong, so I decided I’d write a quick tutorial of tips and tricks for success using the Molotow Grafx Masking Fluid Pen. 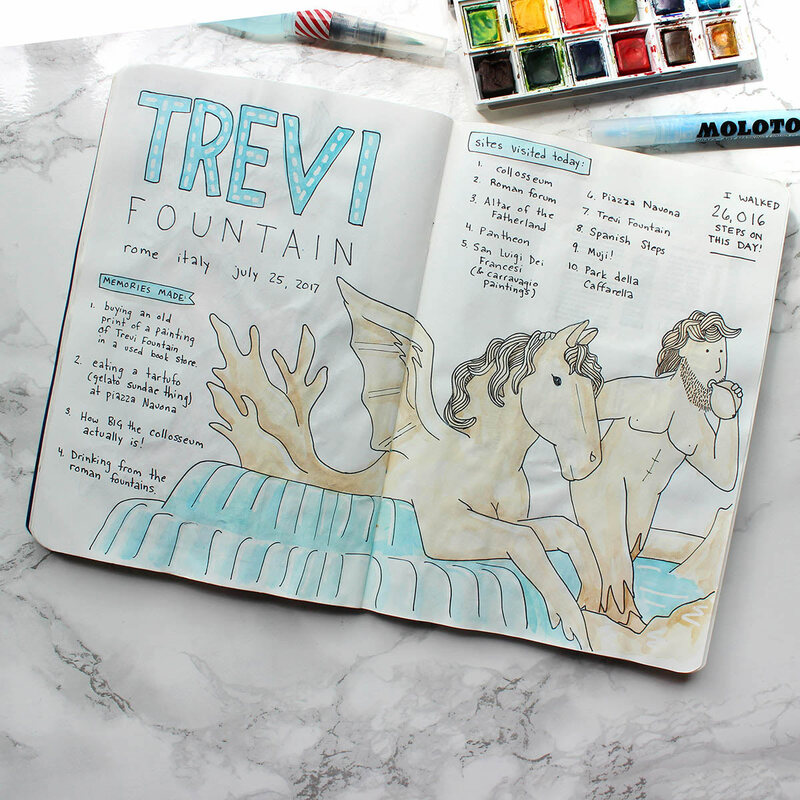 The Molotow Pen was used for the header and the water, as well as a few points of highlight on the sculptured portion of this Trevi Fountain-inspired doodle. This pen was developed for use on watercolor paper, so you’ll have mixed results when using it on other types of paper. In testing, the BEST results were achieved on very close-fibered, smooth paper- paper that either had NO texture or paper with a stamped texture, like watercolor paper. The worst was on open-fiber paper like sketch pads. Thickness/weight of paper seems to have no effect on the final result. Although water color paper has texture, it’s stamped onto the surface rather than being a result of loose pulp fibers. 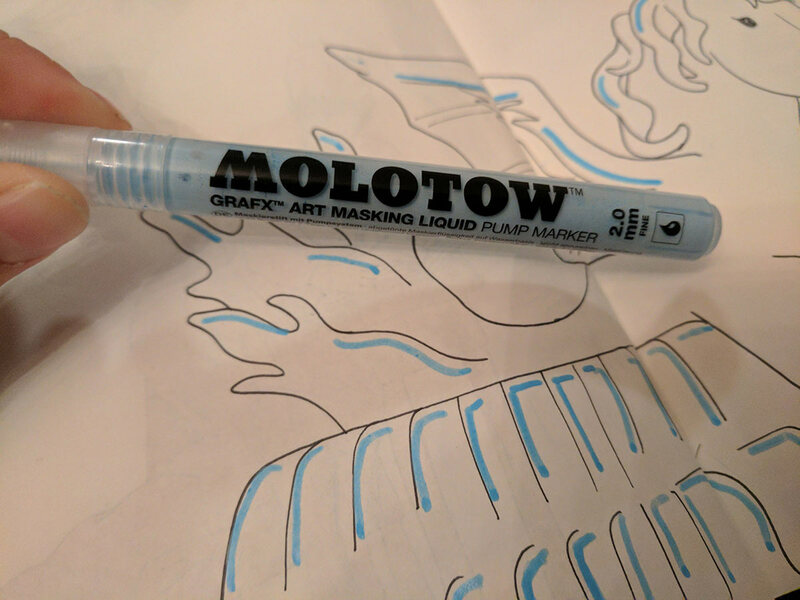 Smooth fiber paper like this is essential for success with the Moloto Grafx pen. This is a pump marker, which works very differently from a typical marker. The liquid inside will not flow unless manually pumped into the soft nib. To prep your marker, place the tip on a scratch piece of paper and press down until the nib moves back into the barrel and release. Repeat, gently, until the blue fluid flows well into the nib. DO: pump the nib into the barrel gentle EVERY time you start to use the pen. DON’T: use the pen without pumping or when the nib isn’t generously flowing. Because the nib won’t automatically refill, you’ll need to stop periodically and pump the pen. The fluid should be flowing onto the page, rather than the nib feeling as though it is dryly dragging across the page. If the pen isn’t leaving fully opaque, almost-pooling blue marks behind, you need to pump more and reapply. DO: pump the nib until the pen leaves fully opaque marks. DON’T: move forward to painting if the mark is translucent or shows the white of the underlying paper- paint WILL bleed. Let the masking fluid dry fully before painting. I give it about two minutes for details or double that for large areas. Once dry you can paint over the blue masking fluid. When you have finished watercoloring and the paper is 100% dry, you can remove the masking fluid. Typically, I rub with my finger to remove the fluid, but you can also use an eraser. DO: Apply masking fluid thickly, in order to allow easy removal by rubbing. DON’T: rub aggressively, as agressive abrasion to your paper may damage to the surrounding color. This is my two cents on this somewhat controversial new product. This pen has a learning curve that will disappoint less careful users, but is an outstanding product. I think most of the negative reviews are probably not using the pen correctly. The pen is meant for certain papers, and requires a unique step- pumping. 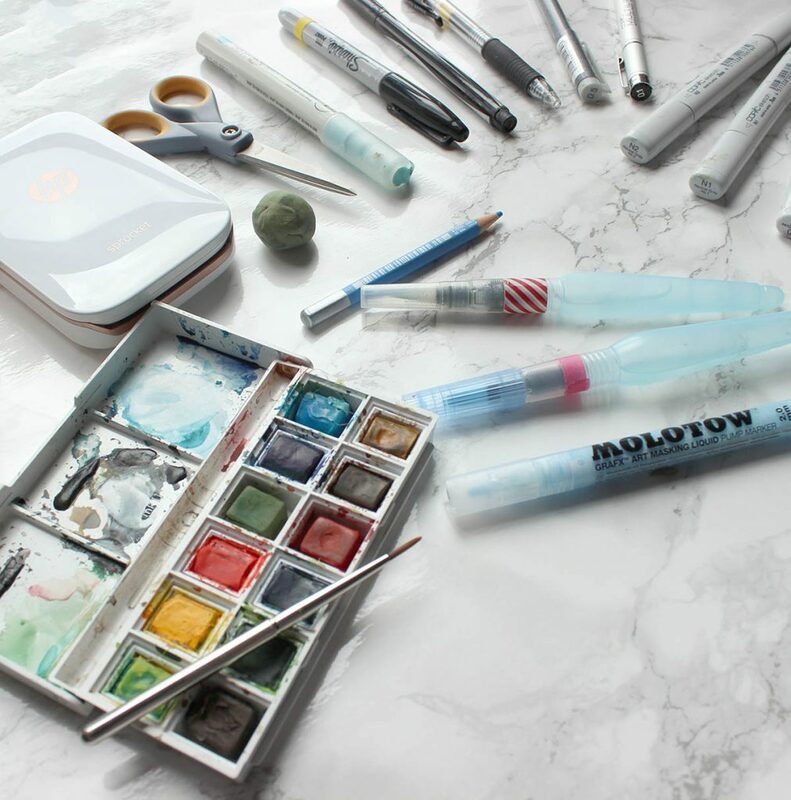 Master those obstacles and lay down a thick layer of masking fluid and give it the appropriate drying time and I think you’ll love this pen as much as I do! Get yours in 2mm Nib or 4mm Nib from Amazon, where healthy competition has the price down to literally half of what the big box art/craft stores sell this pen for. 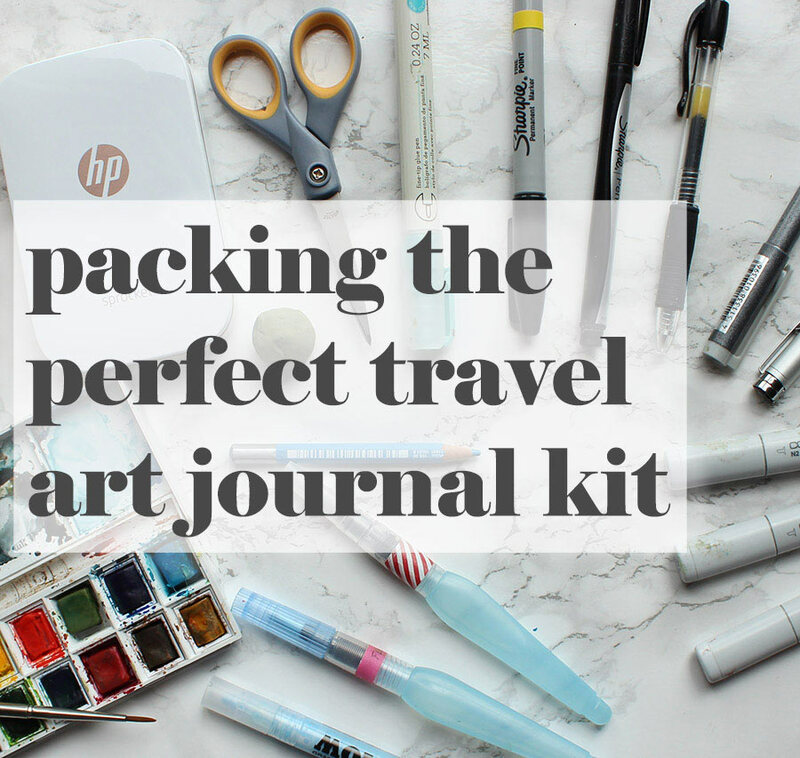 Read more about my Travel Art Journal Essentials. I am brand new to painting. On my second painting, I used this and followed the directions above, but I’m having trouble getting the marks off. I’m afraid to rub to hard. I tried a kneadable eraser. Should I be more aggressive? Hi Angie, what kind of paper did you use? You are wise to want to avoid rubbing too hard. 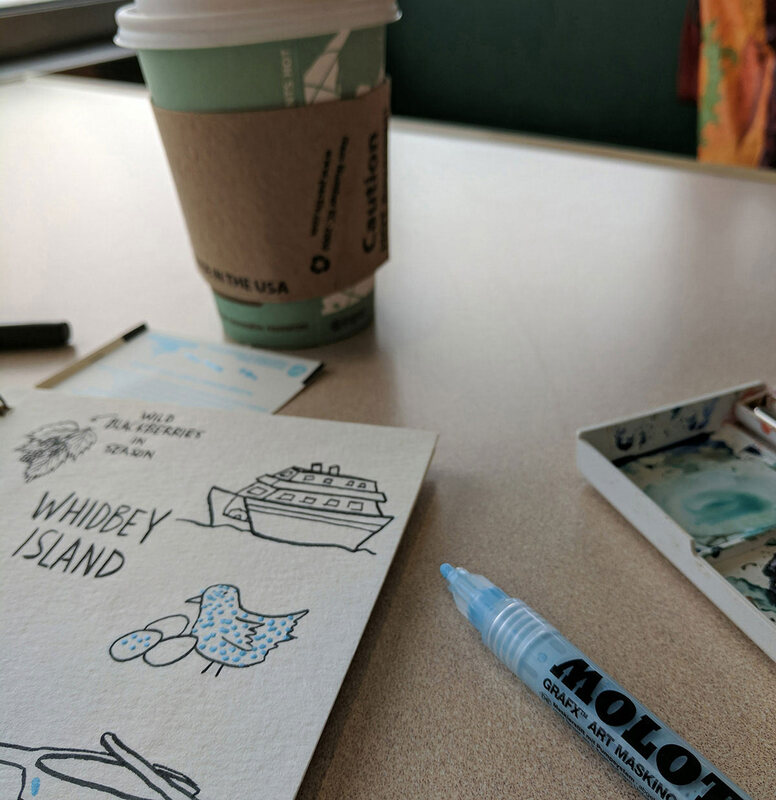 I haven’t tried this but I wonder if warming or cooling the paper a little would change the lift-ability of the masking fluid? Can replacement nibs be purchased for this masking pen? If so where and what would I buy? I don’t think so, but it would definitely be worth sending an email to the manufacturer! They make artist-quality markers, as well, so I would expect that there is a good chance a replacement nib is available.